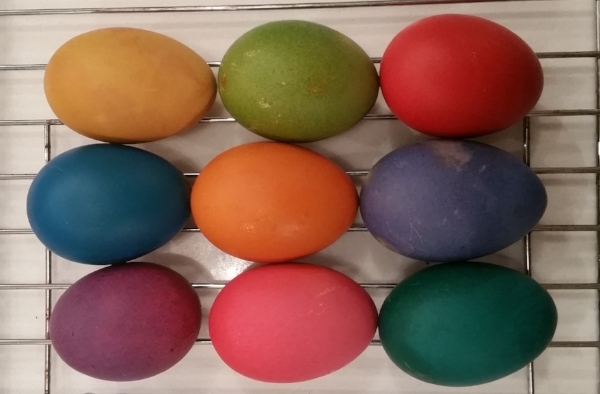 Create Bold Colored Eggs - Naturally! Spring is here and my social media feeds are blowing up with all the cute baby chicks, rabbits, and lambs being born on farms across the country. It's also getting close to Easter and dying Easter eggs! Most people buy white eggs to use with the dye kits so the colors are pretty standard. I had a TON of eggs last spring, and most of them were brown, so I wanted to see what it would look like if you dyed brown eggs. I bought a kit at Target for $1, boiled a dozen eggs, and then proceeded to do something I hadn't done since I was a kid - make colored eggs! 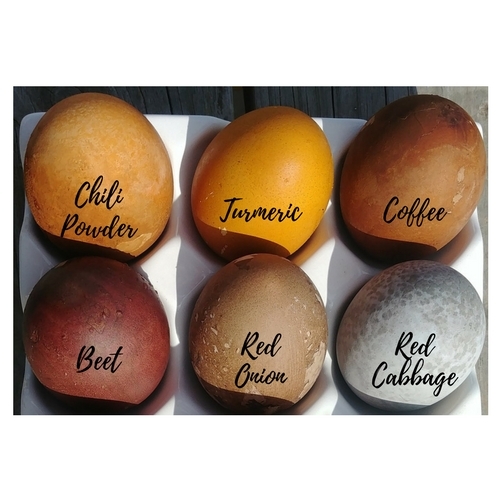 This year, I'm trying to remove chemicals and dyes from our household, so I decided to create dyes from items in my kitchen and then see how they worked with the brown eggs. I've read quite a few different ways to create natural food dyes and so transformed my kitchen into a food dye lab. My kitchen counter looks like an experiment and I have my small saucepans working overtime. Some of the items I tried: red onion skins, beets, red cabbage, turmeric, coffee, and chili powder. These are all things I already had around the house, but some other things I've heard you can use are spinach (green), and yellow onion skins (gold/yellow). Once the water had boiled down to make the dye more concentrated, I poured the water into pint-sized mason jars. I realized I needed to label the jars though as you really can't tell the difference between red onion, red cabbage, and beet just by looking at the liquid. Once I'd done this with all the ingredient's, the countertop definitely looked like a chemist's lab! Super talented - I can write upside down! I can't say my method was very scientific though as I let them sit (and sit, and sit, and sit) because they weren't turning colors that I could see. I finally tried taking them out to dry several times as I'd read that would make them darker. After several days, I finally removed them and let them dry one final time. My favorite surprise color was the Red Cabbage. I love the blue color! So, what did I learn throughout the process? Yes, you can use natural ingredients in order to dye your eggs. You need a lot of onion skins in order to create a vibrant color. Be prepared and have all of the ingredients before you start. This would be a fun experiment with kids since they can make predictions of what colors the egg will turn out, as well as participating in the process. Have you tried making your own food dyes? If so, let me know what worked for you!